The pioneering History of Water series brings a much needed long-term historical and comparative perspective to the understanding of the complex relationship between water and society. The volumes in the series aim to show how analyses of history and societies’ development – from the birth of civilization to the present day – will be enriched and broadened by also bringing the myriad confluences between water and society into the picture. The series is written by scholars from a very wide range of disciplines and from almost 100 countries. It presents a unique overview of water issues in different countries and cultural and geographical regions. It demonstrates that a focus on water-society relations opens up a wealth of new empirical areas and makes it possible to put forward new and inclusive explanations of important historical processes and events, and suggest new theories of social development. The volumes, with their broad, multi-disciplinary approach, will also be of relevance to water managers and water planners all over the world. This first ever series on the broad and varying role of water in history will hopefully be useful for politicians and practitioners involved in water management, but also for teachers and students of global history. It is written by some of the world’s most eminent scholars in their fields. The volumes include a number of maps, drawings and illustrations. 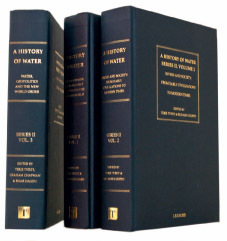 Professor Terje Tvedt is Series Editor of this nine-volume History of Water. This entry was posted on Monday, November 8th, 2010 at 9:24	and is filed under About. You can follow any responses to this entry through the RSS 2.0 feed. Both comments and pings are currently closed.